Anländung der Englischen Trouppen zu Neu Yorck, Franz Xaver Habermann, 1777, Anne S.K. Brown Military Collection. Habermann's print (hastily colored though it is) is an interesting look at the German soldiers of the American Revolutionary War. The long queues, distinctly shaped spontoons, and blue and yellow uniforms all betray the true identity of these supposedly "Englischen Trouppen." I'll save the analysis of the Hessian uniforms for an expert, and instead focus on the sailors carrying them ashore. At the stern of the troopboat are three sailors. Two work a pair of oars, while the third in the middle acts as coxswain at the tiller. All of them wear round hats, jackets that end at the waist with no vents, and slops or trousers. The oarsmen's jackets are blue, while the coxswain's is red. 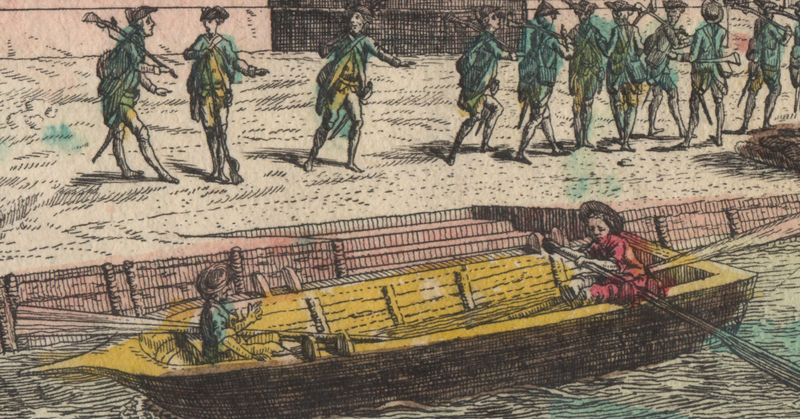 Two oarsmen provide the propulsion for this supply boat, which is guarded by a pair of Hessians sitting further forward. The oarsmen are in shirtsleeves, with one in a blue waistcoat, and the other in yellow. Both wear round hats. 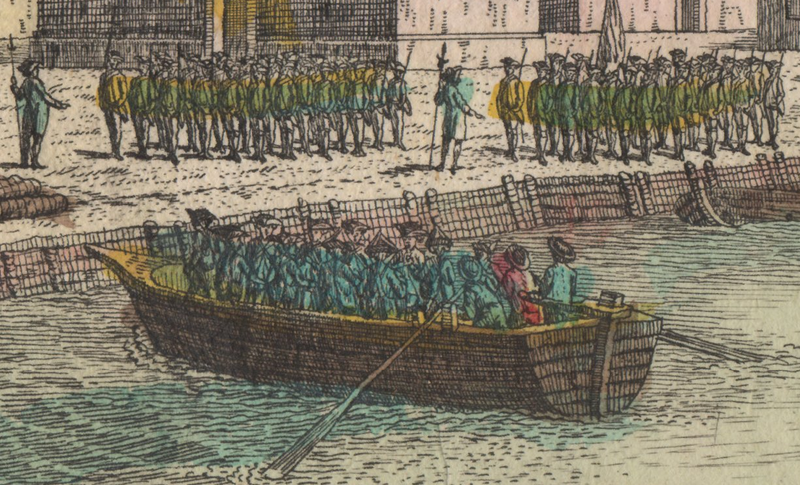 The coxwain wears a cocked hat with the point forward, a long queue, and a blue jacket or coat. It is possible that the coxswain is actually a soldier, given the queue and distinctly different hat. The empty vessel alongside the New York shore appears to have just unloaded the jolly Germans who march off to join their formed comrades. In the bow is a tar with a blue waistcoat, rolled up sleeves, and a round hat. It appears that he wears a pair of breeches, but the detail is simply not there to be more affirmative about it. 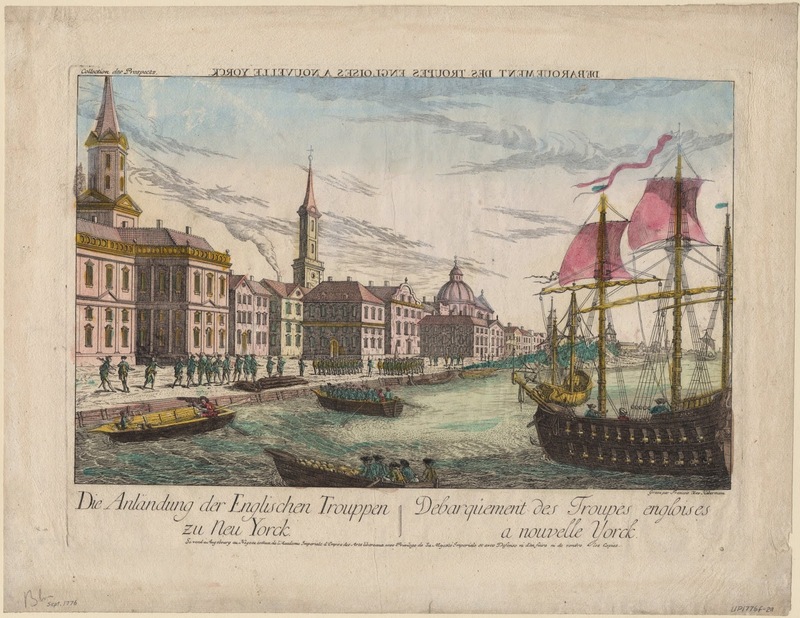 At the stern, his mate wears a red jacket with the sleeves rolled up, and a pair of breeches. Like all the other mariners, he wears a round hat. Finally, we find a few Jacks aboard the man of war with its bristling brass guns. Two wear cocked hats with the point forward and blue jackets. A third, standing amidships, wears a plain workman's cap and a red jacket.